You know there’s something special about a college when someone who graduates from it chooses to return and pursue her own professional career there. That’s what happened to Rachel Pairsh, who graduated from the Peninsula College Medical Assisting Program in 2010 with an Associate of Applied Science and several certificates, including ones in Medical Assisting, Health Care Assisting, Electronic Medical Billing, and Phlebotomy. Today, Rachel is Director of Peninsula College’s Medical Assisting Program and its full-time instructor, and she’s happy to be back where she started, helping others discover a meaningful career path. “Peninsula College’s Medical Assisting Program was fundamental in obtaining my post-secondary training and education in the profession, and it enabled me to obtain my professional credentials,” says Pairsh. She also holds a Medical Assistant – Certified credential through the Washington State Department of Health and a National Certified Medical Assistant credential through the National Center for Competency Testing. Medical Assisting was a career field Rachel knew early on that she wanted to pursue. Since she began working in her early teens, her jobs have been primarily in the service and care industries, including caregiving for both elderly and pediatric clients, so a health-care related profession was a natural choice. Busy as she was, Rachel still managed to excel in the classroom―she was elected to the Beta Delta Nu Chapter of the Phi Theta Kappa International Honor Society, the official honor society for two-year colleges, and also earned the Peninsula College President’s Medal, the highest academic honor a student can achieve at Peninsula College. Graduating students are eligible to receive the medal if they complete a degree having earned 45 college level credits at Peninsula College with a cumulative grade point average of 3.85 or higher. Since graduating and before becoming the new Medical Assisting Program director, Rachel honed her skills in various healthcare settings on the Peninsula, including holding a supervisory position of Lead Medical Assistant at Jamestown Family Health Clinic in Sequim. Prior to that, she was the medical assistant to Dr. Paul Cunningham, also at Jamestown Family Health Clinic, where she was recognized in July 2013 with the Jamestown Employee Honor Award. The quarterly Award recognizes employees who go above and beyond by providing exceptional service, creativity resulting in cost savings or efficiency, playing a key role as a volunteer for tribal functions or events, acting as an ambassador to the community and demonstrating a high level of initiative. Before moving to JFHC, she worked for Olympic Medical Physicians through Olympic Medical Center as a Medical Assistant – Manual Pre-loader, helping the Primary Care Clinic transition from paper charts to electronic charts four years ago. Prior to moving to Port Angeles, Rachel also worked in the small county hospital in the area where she grew up, starting at the front desk as Admissions/Switchboard, and working her way through Medical Records, Accounts Payable, Accounts Receivable, and the Billing/Coding Office to being the sole Credit and Collections Officer for the hospital and clinic. 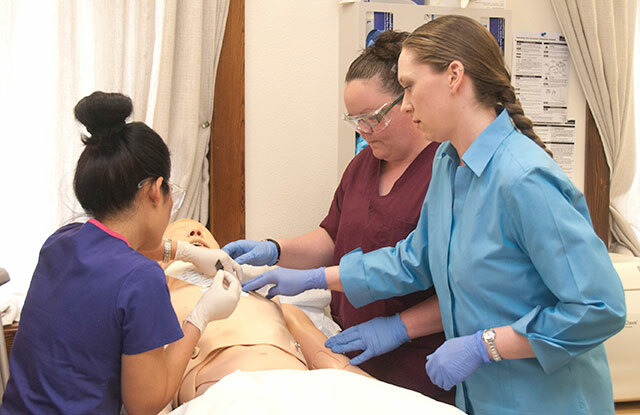 When Rachel discovered the Peninsula College program, she was attending another medical assisting program at a technical college in east central Indiana and was looking for a similar program in the Port Angeles area that would allow her to transfer easily and quickly since she was already planning to move to the area. At Peninsula College, Rachel found a place that offered smaller class sizes, less commute time and expense, and lower tuition costs and fees for the program she was interested in attending. Fortuitously, Peninsula College also is one of only a few colleges in Washington State to offer a Medical Assisting program. These are the same qualities that Rachel now emphasizes and brings to each of her students in the Medical Assisting Program and elsewhere throughout the college. “I encourage people to attend Peninsula College because of the myriad degrees and certificates that are offered here, including Bachelor’s degrees. There is something here for everyone, and there are wide varieties of courses offered online or in evening classes,” she says. Clearly, Rachel’s pathway from student to Medical Assisting Program Director and faculty at Peninsula College did not happen by accident. She was in the right place at the right time, backed by hard work and the right training and skill-set she needed, thanks to her degree from Peninsula College. Now she is helping others develop the skills they need so that they, too, can flourish in the growing health-care field. For more information on Peninsula College’s Medical Assisting Program, please contact Rachel at rpairsh@pencol.edu.